I'm Running to Eat! : OMG! Migas! I am in love! Seriously. Totally. Head over heels in love. I needed something quick to make for dinner last week. Something that didn't require a trip to the grocery store. Flipping through one of my Rachael Ray cookbooks I came across a recipe for Mighty Migas. Eggs, red pepper, jalapeno, onions and crushed tortilla chips, scrambled and topped with cheese and a spicy tomato-chipotle pepper sauce and placed on top of a blistered tortilla. O.M.G. Heaven on a plate. Seriously. I found myself thinking about these while standing at line at the grocery store. Wondering if I had enough eggs to make one while I was brushing my teeth at night. Plotting a way to get someone to bring me some eggs while I was lying in bed at night. Really. These things are like crack. I've made them three times in the past week. My cholesterol is probably through the roof. There really needs to be a 12 step program for these things. LOL! The recipe is from Rachael Ray's Express Lane Meals cookbook. As I was looking for the recipe online (and jonesing for my next fix) I realized there are a million migas recipes out there and they all sound delicious. Imagine my surprise when I came across a link ... to my own blog! Yes, it's true. 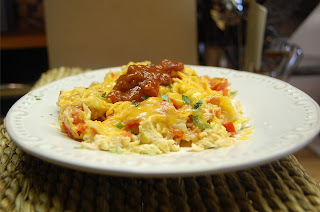 I actually blogged about Slightly Cheaper Than Therapy's recipe for Migas back in May! I remember (now) that I did like them but for some reason I never made them again. I think what I love the most about Rachael Ray's recipe is the Chipotle Sauce on top. All that smoky, delicious heat. ::sigh:: And the RR version isn't really a taco. The flour tortilla is blistered in a dry skillet for 30 seconds or so per side so that is crispy. Mmmm! Here are a few recipes for Migas for you to check out. And I'll include the recipe for the wonderful Tomato-Chipotle Sauce to top them with. In a small bowl stir together the tomato sauce and the chopped chipotles. Stir in cilantro and serve. Great idea! its nice because I have all of this on hand at any given moment.